There’s always something out there. 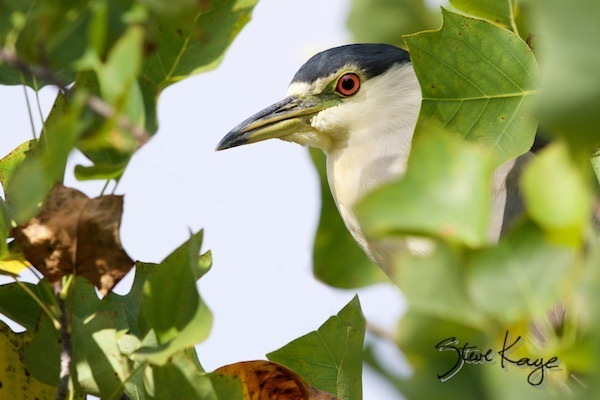 Here is a Black-crowned Night-Heron, watching people as they walk by. Sure, it’s hiding up in a tree. And it knew you were there long before you looked up. So as you walk, travel slowly. Pay attention to the life that’s around you. There may be a treasure waiting to be discovered. Why: Shade grown coffee naturally grows in a shade, rain forest environment. So this protects rain forests by supporting farmers who grow coffee in earth-friendly places. Shop for shade grown coffee at: Grounds for Change, Birds & Beans, or Dean’s Beans (Just to name a few). I captured a photo of the night heron in Atascadero at the lake. The lake is dry now, so I suspect the water birds have left, too. Steve, incredible shot as always. I have long admired your work and aspire to your level of photographic skill. Thanks for sharing!